Sirona is a registered Charity (Charitable Incorporated Organisation; CIO) as of January 2017, (previously a Community Interest Company) and would not be able to operate without help from many people, companies and organisations. 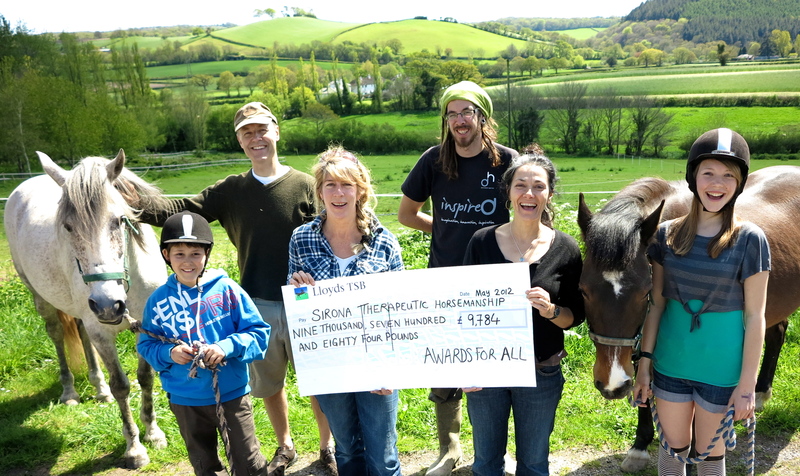 We rely on funding and donations to be able to continue our work with young people and adults experiencing difficulties and who would benefit from participating in Therapeutic Horsemanship. Listed below are those we wish to thank for all their support, advice, materials and help we’ve received in setting up Sirona. The European Agricultural Fund for Rural Development Europe investing in rural areas has supported the development of the new stable block and arena at the Dartington site. A big thank you to Stephen Bond from ‘Heritage Places’ for his pro-bono work. We can highly recommend his work on planning applications. Thank you to our equine dentist Keith Evans who provides a professional dental service to our horses in a kind and gentle manner – we fully recommend him. A Big thank you to our vet Richard Frost of Tor Equine for his excellent veterinary care of our horses. A big thank you to our farrier Tim Hughes at ‘Hughes Shoes’ for providing us with a fantastic service trimming and shoeing our horses. One of our largest costs is the maintenance of our team of horses in order to keep them healthy and happy for this valuable work. In addition our annual insurance is over £2000. All donations are gratefully received no matter how big or small. Just knowing we have support for what we believe to be truly positive helps keep our organisation going.